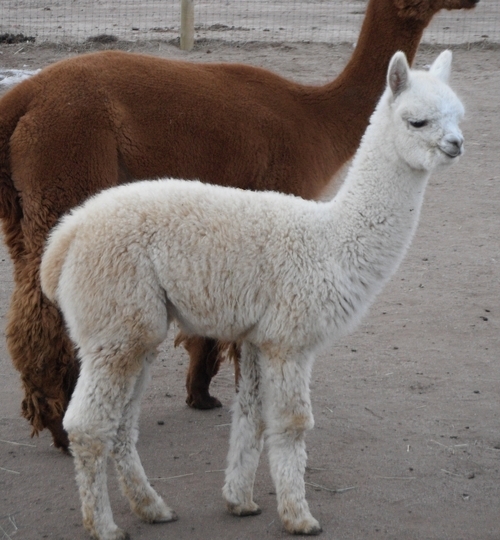 Carlie w/ Valor -- her beige 2011 cria sired by Crescent Moon's Gear Jammer! 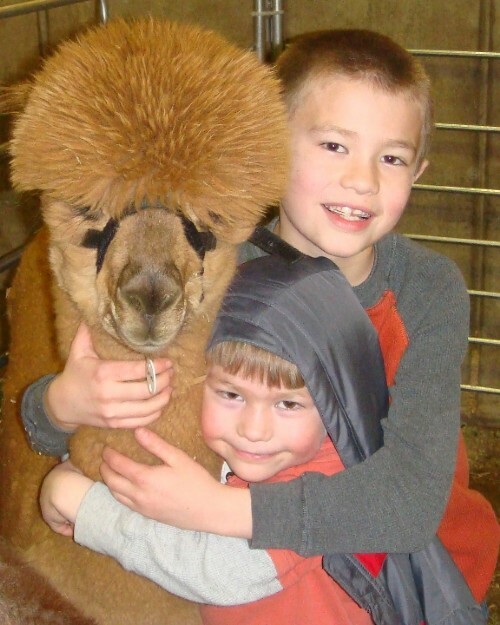 When we brought Carlie on our farm, she was the deciding factor to include her dam in the package, and her cria fleece was so nice that the selling farm stipulated that they had to keep it! Carlie went on to win show ribbons for us in the ring before settling into her breeding dam role in our program. Her fine fiber had a soft handle, consistent crimp with long staple and good density, and a healthy shine that the judges noted. Her crimpy & dense fiber with its good handle & staple length had not only garnered her ribbons, but also had prompted us to pair her with some of the best males we could find -- such as Crescent Moon's Gear Jammer, Mile High Toulouse Lautrec, and Patagonia's Ernesto! 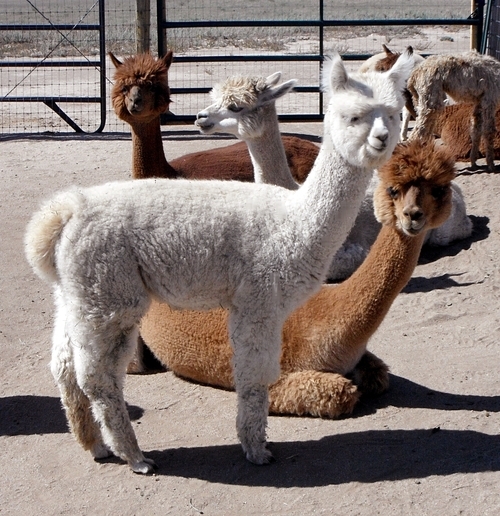 Her crias range from a beige to an light fawn to a rich medium brown. 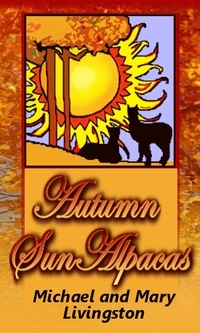 But all of her crias have been fine with good shine. Carlie's conformation and bite are good and her frame is solid. Her crias have heavy bone and a strong frame from her. Additionally, along with great fiber characteristics, Carlie's crias are embodied with her easy going personality traits. She is easy to handle and lead, and her crias are calm, too. 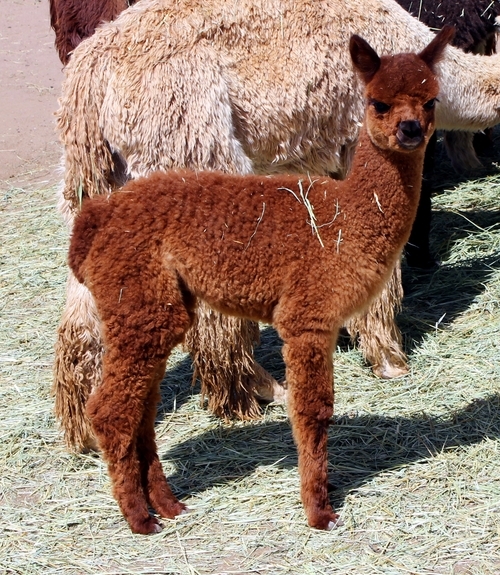 Her first cria born in 2012, was a beautiful girl sired by Gear Jammer! This girl's fiber is extremely fine and long with a high frequency crimp style. We are thrilled with our Medal of Valor and the cria she produced. In 2013, sired by the 2011 GWAS color champion and judge's choice winner Mile High Toulouse-Lautrec, Carlie produced a sweet boy that stood with the carriage befitting his royalty. 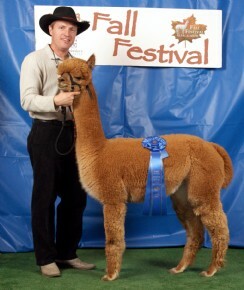 He was a great male with lots of fiber, a good example of the healthy, quality crias that Carlie produces. From her pairing with the amazing Patagonia's Ernesto she produced a beautiful medium brown boy! 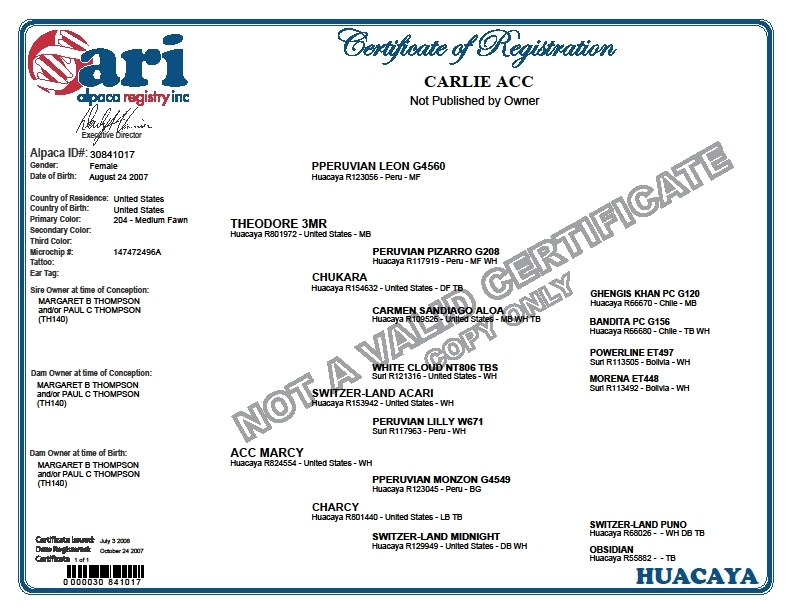 This shows that Carlie can let the service sire's coloration come through!